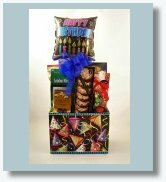 A great selection of festive Gift Baskets for your important Celebrations! 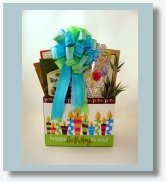 This festive birthday box is loaded with good wishes for a happy birthday. A great birthday gift for everyone! 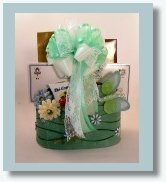 A pretty floral birthday box, filled with a variety of sweet treats to savor and enjoy! 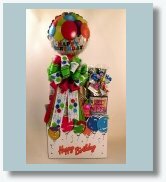 This vibrant birthday box is guaranteed to bring smiles, oohs and aahs! A sweet sampler for the birthday girl to enjoy. A festive gift box for the partier in your life! Sweet and savory treats to enjoy and to share. A very special occasion calls for a spectacular gift. Our elegant sterling tray design is loaded with upscale gourmet foods.